Hey there humans! My name is Blake, an’ today I getta try out this blog thingy. It’s my first blog, so I may not say a whole lot… I just wanna try it out! So, here is my basic info — I’m a Pit Bull/Boxer mix a lil over a year old. A nice guy who volunteers here found me at the end of his driveway without a collar or anything, and brought me here, and no one ever claimed me, so I’m just hangin’ out here waitin’ for my forever home. I always get ice cream on my way home from obedience class! This is a pretty cool place to hang out though, instead of bein’ out on the streets, havin’ to take care of myself. Here I have a clean, cool place to sleep, I get regular meals, I have lots of girlfriends (both human, and doggy girlfriends), and a roommate, Orchid. Plus, the humans here give us lots of attention, and there are volunteers, too, who come in and take me to obedience class at The Dogs’ Spot, on outings, and my favorite volunteer who loves to wrestle with all us dogs, and even jumps in the kiddy pools with us!!! LOL! 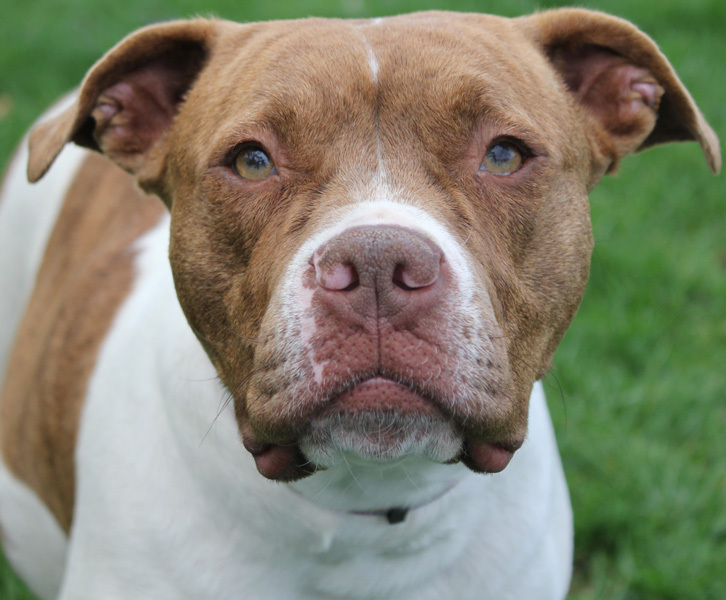 Life’s good here… but I do wanna find a forever home, like Hercules has found. He spent last weekend with his soon-to-be new dad, and came back looking like he had been spoiled with lots of treats and extra tasty food! I heard he’ll be goin’ to his forever home soon, which is awesome for him! I’ve been workin’ on being good in obedience class, so I can go on to learn some agility stuff. Merrick comes back braggin’ ’bout the agility stuff he’s learnin’ with Harrison, and I gotta catch up ’cause I can’t have Merrick of all dogs lookin’ better than me, lol. Orchid says it’s lots of fun, too! In case you’re wondering about my nickname, it’s ’cause I like only girl dogs… not that I’ve got anything much against boy dogs, I just wanna be the only boy! I mean Hercules seems okay, Max is probly all right, but I’m a flirt with the girls like Xena, Bianca, Orchid and I loved havin’ Betty Jo as a roommate before she was adopted. See, not all the other dudes here can handle all the ladies like I can… ha ha! When Xena and I first met, it was obvious to me she didn’t really know how to play with dogs (which is kinda sad, but she’s gettin’ much better), so I play bowed to her, hunkered down low and licked her chin to let her know I wanted to play. She kinda jumped back all startled like the first time I did that, (which was really funny, but don’t tell her I said that) but she’s come around. I love Orchid, and Bianca too… I think I have a “type”. Anyway, our humans think it’s funny I’m such a ladies man and one human made a short video ’bout me, and I think I look real good, so you gotta check it out. Well, I gotta go… I have a date with Xena! Next time I blog, I’ll tell ya ’bout my ideal forever home. If ya wanna learn more ’bout me though, check me out here. Hey there humans, how-ya doin’? My name is Bowie. 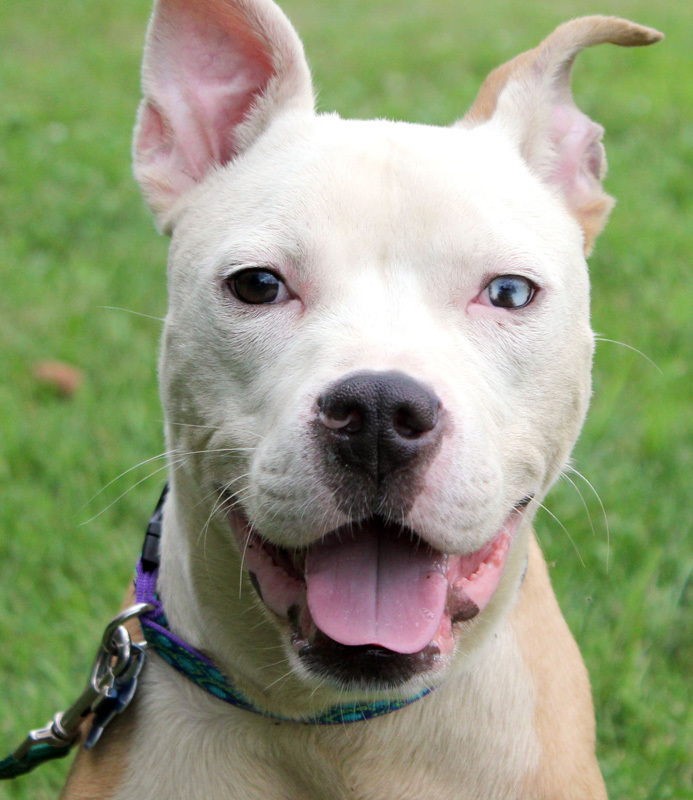 I’m a 5 year old Pit Bull mix with the most awesome eyes… see I’ve got one blue eye and one brown eye… cool, huh? I guess our humans named me for some famous guy named David Bowie ’cause he’s got 2 different eye colors, too. Anyways, I was found as a stray right after the 4th of July… all of those booms and bright stuff up in the sky was kinda scary, ‘specially ’cause I was out on my own. Well, a nice woman found me and brought me here. I was reallly skinny!! I only weighed 33 pounds when I came in, I had some sores on my legs and didn’t smell so good (I overheard the humans who take care of us sayin’ I kinda looked like a baby hippopotamus, and I dunno what that is, but I’m guessin’ it’s pretty dang cute if it looks like me). Now, ’cause our humans are soooo awesome, I weigh around 45 pounds, after less than 1 month!!! They’re feedin’ me good here! I guess ’cause I’m lookin’ so handsome now that’s why I gotta go to my first satellite adoption event thingy last Saturday, and… I’m goin’ to another one on Friday!!! I’m really excited! Me, Ethan & Etta, Farley, and maybe a couple more dogs are going to Tail Waggin’ Pet Stop for a human event called First Fridays… I think it’s got somethin’ to do with art… and hey, that reminds me, HSGKC has a BIG fundraiser comin’ up August 22nd called Art Unleashed… sorry, I got kind sidetracked. So, anyways, we’ll be at the Tail Waggin’ Pet Stop this Friday, August 7 from 6-8 pm, if ya wanna come meet some of us! I gotta say, Ethan & Etta are a hoot to watch! They’re super cute together, and we’re all hopin’ they go to a home together! I wish my best friend, Dwayne (our humans have been goin’ back and forth ’bout his name… some humans like the name Dwayne, and others like the name Bullwinkle… you humans are so FUNNY) could go, too, but he’s not quite ready to go to somethin’ like a satellite yet ’cause he’s still bein’ treated for demodex mange. He’s real sweet, like me, and we LOVE playin’ together. Sometimes though… if we’re left to our own devices, we kinda get into a lil bit of trouble… we don’t mean to, but we’re dogs, and sometimes we just wanna chew some stuff up. Sorry ’bout the extension cord and the doggy bed, btw. I think this is gonna be a busy month for our humans with the satellites and Art Unleashed comin’ up. Check out hsgkc.org for more info about the upcoming events! And, don’t forget, you may wanna come meet me on Friday! I’m a real good boy, I walk nice on a leash, I’m good with other dogs, and I’m great with humans of all ages! That’s all I got for now… ‘ll talk ’bout the kinda forever home I’d like the next time I blog (unless I get adopted… which could happen). I’m gonna go hang with Dwayne for a bit, then take a nap. Bye! hi humans! 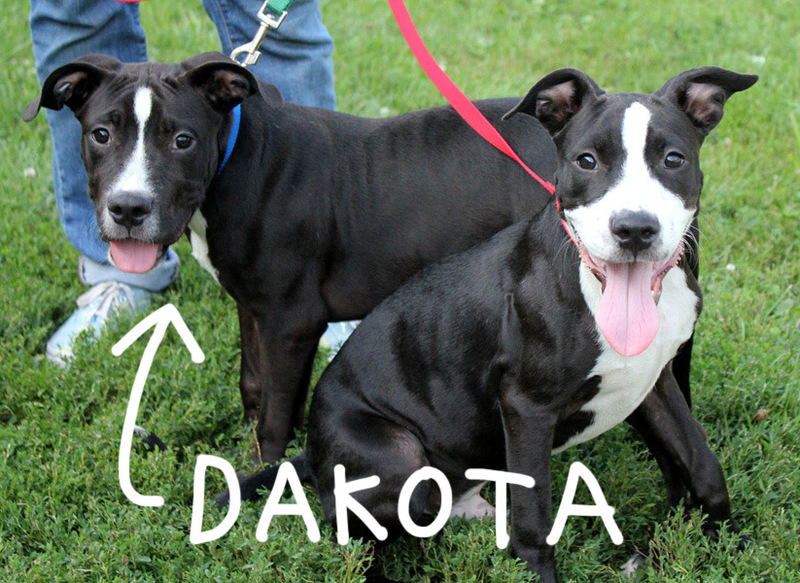 we’re Denver and Dakota an’ we’re 4 1/2 month old lil pit bull mix puppies. i’m Denver an’ i’m gonna talk more ‘cuz my brother, Dakota, is a lil shy at first sometimes, but not me!! i’m real friendly an’ outgoin’ an’ wanna meet everybody now ‘cuz all the humans we meet are sooooooo nice to me an’ my bro. we got to blog today cuz we’re goin’ to somethin’ called a sat-eh-lite ah-dop-shon event on saturday at Brookside Barkery an’ Bath. Vinny just told me we’re goin’, an’ he’s goin’ too, an’ that’s great ‘cuz we like Vinny. i dunno ’bout it, but Vinny told us it’s fun ‘cuz we’ll meet lots of new humans, an’ we’ll get lots of attention an’ treats. we’re both happy we get to go ‘cuz it sounds fun! we would’ve blogged yesterday, but we had to get “fixed”… i’m not real sure what that means ‘cept we can’t make puppies of our own an’ i think that’s good ‘cuz we’ve seen lots of dogs in our lives already, so we know lots an’ lots of doggies need homes, too, not just puppies. wanna know somethin’ else?!?! me an’ Dakota get to go to a fore-ev-er home together. i was listenin’ when our humans were talkin’ ’bout us, an’ ‘cuz we’ve been thru lots already, they don’t wanna split us up. i’ll let Dakota talk ’bout that. anyways we love each other, an’ we play together, an’ eat together, an’ sleep together… an’ really don’t wanna be apart. when we’re playin’ outside in the yard together, we always stay close to each other…our humans always tell us how cute we are together an’ make a big fuss ’bout us! be sure to check out our video so you can see us in action! an’ cuz we’re sooooo cute together an’ we make our humans smile lots, who wouldn’t want both of us?!?! we really love all the humans we’ve met here ‘cuz they’re so nice to us. we moved into the main kennel on thursday, an’ it’s okay… kinda scary ‘cuz there are lots of big doggies, but we’ll be ok! i’ve heard of doggy play groups an’ those sound like fun, so maybe we’ll get to be in one of those soon! k, i’m gonna let Dakota blog now. bye! i’m Dakota.. .uuhhmm, i know my bro talked ’bout some of our story an’ he wants me to tell the rest. me an’ Denver were in the oak-la-ho-ma city animal control shelter when a human, Steve (he’s one of the HSGKC humans who takes care of us), came in to pick up 2 older dogs named Lucky an’ Chica (Kate calls them “the Bickersons”, an’ after ridin’ with them for a few hours, i know why… they bark an’ make lots of funny noises. i guess that’s how they talk to each other… it’s funny). i heard that Lucky an’ Chica were there ‘cuz their adopter dropped them off an’ didn’t tell HSGKC that he couldn’t take care of ’em anymore (HSGKC promises adopters they will always take back pets they adopted if things change or don’t work out, an’ that’s cool). Luckily, the oak-la-homa city shelter checked for microchips and found out Lucky an Chica belonged back at HSGKC and that saved their lives. anyways, when Steve got there, he saw sooooo many dogs. he asked the human who brought out Lucky an’ Chica ’bout the next doggies who were gonna be put to sleep to make space, so that human brought out my brother to meet Steve. Steve took one look at him, then peeked ’round the corner an’ saw me, too, an’ told that human “I’m takin’ them with me”… so Steve’s a hero an’ so are all our other humans here at HSGKC ‘cuz they saved our lives. our humans really want us to go to a fore-eh-ver home together ‘cuz we’ve gone thru a lot an’ we’re just babies , an’ i’m real happy ’bout that. when Denver was gettin’ fixed, i cried an’ cried for him cuz i didn’t know where he went… but when i saw him a lil later, i felt lots better cuz we don’t like bein’ apart. we’re real lucky to be here an’ we love our humans. i’m kinda tired now, an’ gotta rest up for the thingy we’re goin’ to saturday. bye! 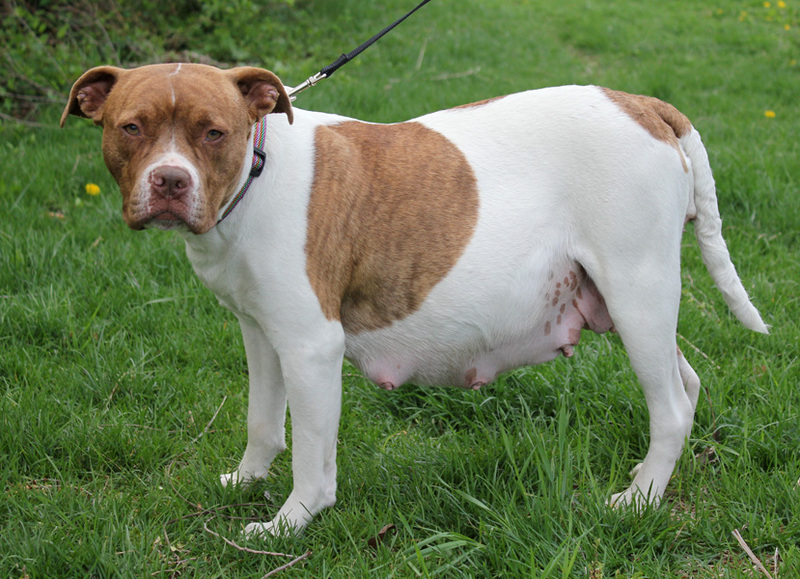 Hello, my name is Ruby, and even though I’m not up for adoption, I get to blog ’cause I’m very pregnant. I was brought here by a nice woman who couldn’t keep me. I’m about 18 months old. On Saturday, I got to hang out behind the front desk of our clinic. I loved getting all of the attention from everyone who came in, and the volunteers, and Joyce and Christine who also take care of me (I like them lots, but only ’cause Pete wasn’t here… I adore Pete). I love getting special treatment, but the reason I wanted to blog is to tell you humans about the importance of spaying and neutering your pets. Check out my pic below, and you’ll see how uncomfortable I look… and I am… very uncomfortable. Yes, this is me… no air-brush or photoshop on this pic! But that’s not what I wanna talk about. About this time every year, so I’ve heard, there are lots of unwanted or found litters of puppies humans can’t always keep. Sometimes ’cause somebody didn’t know their 6 month old female puppy could get pregnant, or that they could have had her spayed before then. Sadly, the puppies fill up the shelters quickly. So if you wannna have the experience of raising a puppy, that’s great, but please consider adopting instead of buying or letting your own dog have a litter (trust me, she will thank you for this). As shelters fill up with puppies who need homes, it makes it harder for us adults to find wonderful forever homes, too. Sometimes we’re overlooked ’cause puppies are so stinkin’ cute. Nothing’s wrong with puppies, they’re loveable, fun and stuff… but there are lots of advantages to adopting an adult dog. Some adults, like me, are probably house-trained, we don’t chew on stuff we’re not supposed to, and we’d love some exercise and play time, and walks, of course, but we don’t need as much as puppies do… they’re exhausting, trust me… this isn’t my first litter. 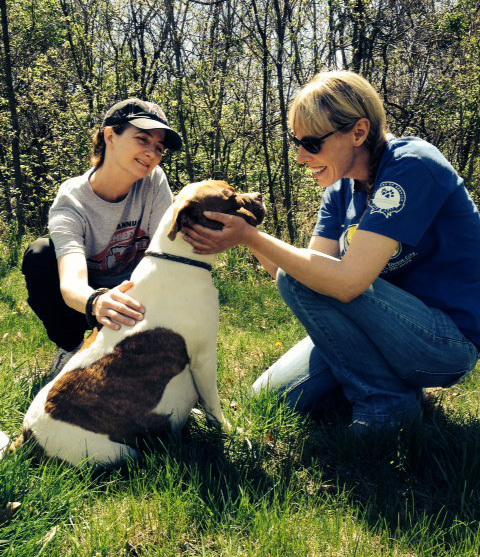 Us adult dogs need love and forever homes, too. So please, please, spay or neuter your pets! I’m tired, so I’m gonna take a nap now. These are my friends Crissy and Christine giving me some extra love.